OHATS (Organizational History and Tracking System) for T/MC !! OHATS (Organizational History and Tracking System) is an organized and systematic way for a group, program or network of community organizations to record, observe, analyze and report contributions and key events that influence progress toward its mission and goals. For example, one can use OHATS to track accomplishments and results, organizational procedures, lessons and best practices, critical external events that influence the work, and service delivery details and statistics. The idea behind OHATS is simple and proven throughout history: if a community group tracks actions, events, lessons and results important to their success then they can learn from them and be more successful. OHATS is hosted on the Program Locator server at Brinkster, and the SQL database that feeds graphics on the site is not working due to interface problem with new Cloud Server. The log in page is also not working, so cannot log in and add new entries, or download data. Seeking help to fix. while the new version of OHATS solves many of the issues of the previous version we don't have the manpower to teach others to use it and since we cannot demonstrate that anyone is viewing OHATS and making funding decisions because of it we can't motivate our own staff and board to use it. 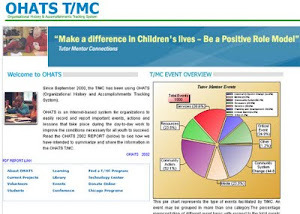 The T/MC OHATS is now located at [http://www.tutormentorprogramlocator.net/OHATS/home.aspx] The Tutor/Mentor Connection has been building its on-line organizational history and tracking system (OHATS) since 2000. It was created and launched in 1999-2000 with a $15,000 grant, but has been maintained since then by volunteers, with minimal technology upgrades to avoid spam and make it more useful to users. In August of 2007 Ganesh Mahalingam, a volunteer from Baltimore, MD, offered time and talent to help take OHATS to the next level. The new version of T/MC OHATS is now on line and being used. Read more below. Read this [PDF document www.tutormentorexchange.net/OHATS/Reports/TMC_OHATS_Report_Sep-00_thru_Mar-02.pdf] to see how we have intended to summarize and share the information in the OHATS T/MC. View this video to learn more about OHATS. Visit this group to help build the OHATS and create better understanding of what it is telling us. T/MC OHATS is now hosted at http://www.tutormentorprogramlocator.net/OHATS/home.aspx (moved to current location in 2009) . From the Metrics pages a link points to a discussion for each metric, hosted at http://tutormentorconnection.ning.com . These discussions provide more information related to each metric, and enable us to talk about what additional enhancements need to be taken. Thank you Ganesh for the great work you've done on this. The bottom graphic on the metrics page is not displaying properly. What are other things we'd like to do with OHATS T/MC? What is the costs of continued work from Ganesh and Steve, and of the maintenance, marketing and analysis of the information we are collecting? This section should provide this information, and should be used in future funding proposals. link of data with GIS maps?